Rochester Institute of Technology’s hockey team is playing in the NCAA Division I Semifinals this evening so when my friend Warren asked if we were having a “Frozen Four” pizza I couldn’t help but wonder what that pizza might look like. Andrew and I planned to have lasagna while watching the game on ESPN 360, but instead I created the RIT Frozen Four Pizza. Because the RIT Tigers sport orange, black and white uniforms I choose cheddar cheese, spelled out RIT in bacon and made little hockey sticks and pucks out of bacon and kalamata olives. 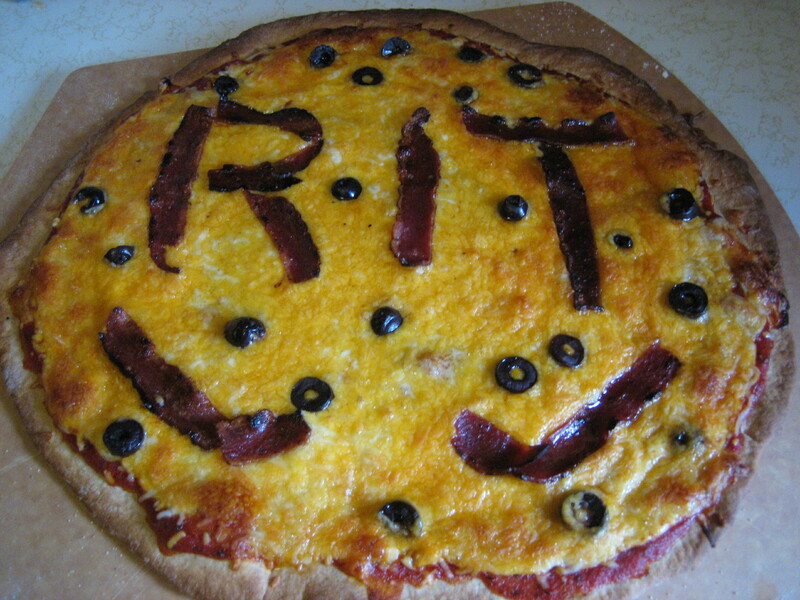 I recommend this pizza recipe to all RIT Tiger fans! I am so grateful to my husband for coming up with the idea for “52 Pizzas.” He is brilliant. 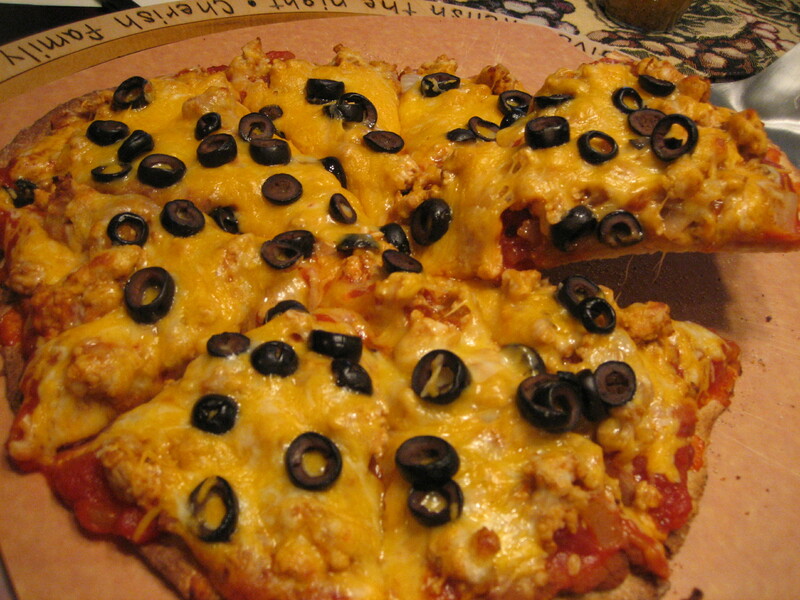 The pizzas keep getting better and better and I am having such a great time trying new combinations of foods. Most of my pizzas to date have included mozzarella, cheddar or parmesan cheese, but this week I wanted to branch out in my cheese selection. Andrew loves, LOVES Brie. 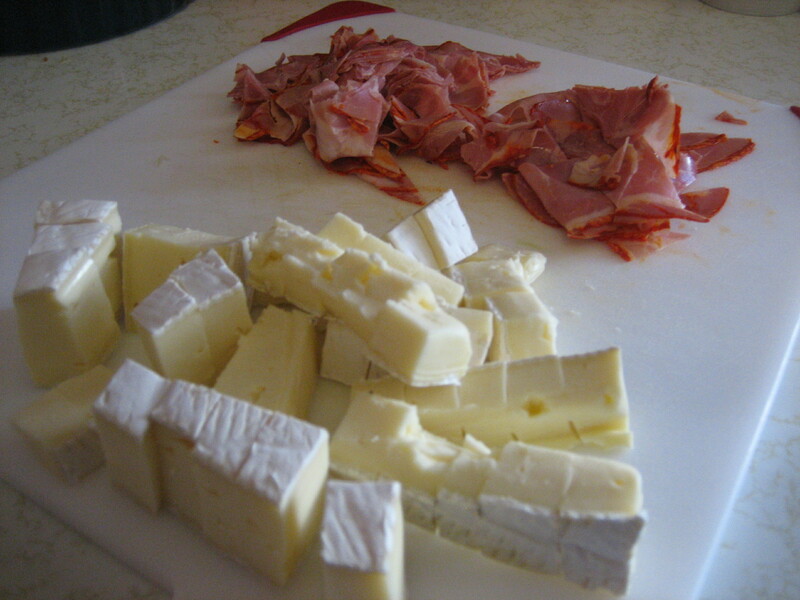 I read somewhere about combining Brie and capicola, a meat I never had before, but thought it sounded interesting. Andrew explained to me what capicola is, that got my wheels turning. Two additional toppings came to mind; olives and garlic. We usually eat olives out of a can but this time I went all out and bought olives in a jar! Well worth it. It has taken me many years to develop a taste for olives so Andrew noted my response when sampling them, “Holy crap, these are good.” I bought hot capicola, an excellent choice. We usually buy President Brie, but the cheese guy at Wegmans suggested their own Brie, another excellent choice and it saved me a dollar. For this creation I roasted a garlic bulb, mashed it with olive oil and spread it on the pizza dough. 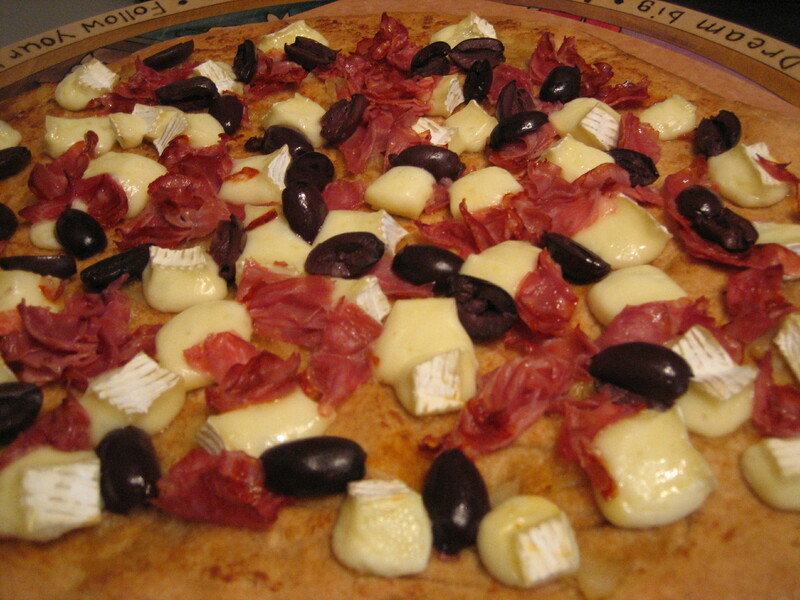 I sliced the olives, capicola, Brie, and tossed it all on the dough. We weren’t sure how the Brie would melt, and in retrospect it should have been sliced much thinner because it didn’t spread as much as I would have liked it to. Now it may not make for the prettiest picture, but “The Quagliata” may be my favorite pizza yet. It was outstanding! This pizza recipe is named after my father-in-law, Terry Quagliata, for his love of all the ingredients used. This pizza was so good that Andrew delivered the last couple of slices to his dad so he could enjoy his namesake. Terry just called and gave me his seal of approval!